All of our products are sourced directly from our range of approved factories. All of our parts are subject to quality testing and are ISO TS16949 certified, we also search to make sure that our approved manufacturers use the latest technologies and materials available. 5 x Injector Copper Seal ( 6110170060 ). 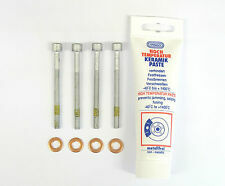 Kit includes : 5 x Injector Bolts ( 0009902907 ). INJECTOR BOLT FOR COMMON RAIL DIESEL INJECTORS. 100 g CERAMIC GREASE. WASHER SEAL High temperature Ceramic grease prevents. 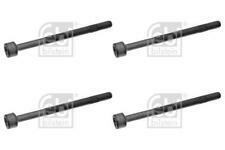 Kit includes : 4 x Injector Bolts ( 0009902907 ). 4 x Injector Copper Seal ( 6110170060 ). INJECTOR BOLT FOR COMMON RAIL DIESEL INJECTORS. 100 g CERAMIC GREASE. High temperature Ceramic grease prevents. Modern fuel injection systems are designed specifically for the type of fuel being used, primarily petrol and diesel. Why this exclusivity?. Fuel injection systems are designed to mix fuel with air. This is an original quality part manufactured by Febi. FOR VW CARAVELLE. Vehicle compatibility. Quantity Included:1. 5 x Injector Copper Seal (6110170060). 5 x Injector Bolts (A0009902907). INJECTOR BOLT COPPER SEAL WASHER AND BOLT KIT. FOR COMMON RAIL DIESEL INJECTORS X 5. Screw Form: Collar Screw. WASHER SEAL Thread Length: 54mm. 4 x Injector Copper Seal (6110170060). 4 x Injector Bolts (A0009902907). 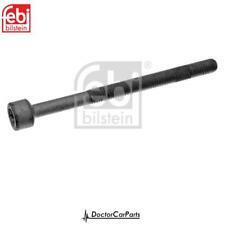 INJECTOR BOLT FOR COMMON RAIL DIESEL INJECTORS X 4. Screw Form: Collar Screw. WASHER SEAL for universal Cylinder engines. Kit includes. BOLT & WASHER / SEAL. 4 x Injector Bolts (A0009902907). 4 x Injector Copper Seal (6110170060). INJECTOR BOLT FOR COMMON RAIL DIESEL INJECTORS X 4. Screw Form: Collar Screw. WASHER SEAL Thread Length: 54mm. Kit includes. 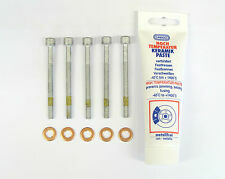 Kit includes : 6 x Injector Bolts ( 0009902907 ). 6 x Injector Copper Seal ( 6110170060 ). INJECTOR BOLT FOR COMMON RAIL DIESEL INJECTORS. 100 g CERAMIC GREASE. High temperature Ceramic grease prevents. This is an original quality part manufactured by Febi. Equivalent Part Numbers. Required Quantity:1. This is an original quality part manufactured by Febi. Bolt | Nut Version:Stretch Bolt. Bolt Head|Nut Design:Female Torx. Part specifications. Vehicle compatibility. Equivalent Part Numbers. This is an original quality part manufactured by Febi. Weight:0.070 kg. Stroke:50 mm. Part specifications. This is an original quality part manufactured by Febi. Febi Fuel Injector Seal 46152. Equivalent Part Numbers. This is an original quality part manufactured by Febi. Weight:0.113 kg. Equivalent Part Numbers. This is an original quality part manufactured by Febi. Weight:0.542 kg. FUEL INJECTOR SEAL fits MERCEDES SPRINTER Bus - 95>06 - FE29140. Equivalent Part Numbers. This is an original quality part manufactured by Febi. Weight:0.046 kg. This is an original quality part manufactured by Febi. Part specifications. Vehicle compatibility. PART CHOICE ALERT. PART NUMBER 13647509752. PART NUMBER 13641437487. PART NUMBER 13641730767. A SINGLE FUEL INJECTOR SEAL. I aim to resolve issues. Why this exclusivity?. Fuel injection systems are designed to mix fuel with air. It is a system that admits the fuel into an internal combustion engine. Modern fuel injection systems are designed specifically for the type of fuel being used, primarily petrol and diesel. Equivalent Part Numbers. This is an original quality part manufactured by Febi. Weight:1.036 kg. Vehicle compatibility. PART CHOICE ALERT. Part specifications. 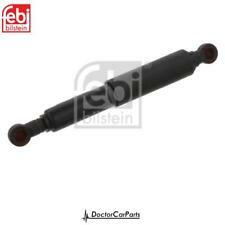 This is an original quality part manufactured by Febi. You'll have the part ASAP. We will always attempt to rectify the issue as fast as possible! Thread Length [mm]:55. With this in mind, we will indicate what type of product you are looking at within the following guidelines. 5 x Injector Copper Seal (6110170060). 5 x Injector Bolts (A0009902907). INJECTOR BOLT FOR COMMON RAIL DIESEL INJECTORS X 5. Screw Form: Collar Screw. WASHER SEAL Thread Length: 54mm. Kit includes. 5 x Injector Bolts (A0009902907). 5 x Injector Copper Seal (6110170060). INJECTOR BOLT COPPER SEAL WASHER AND BOLT KIT. FOR COMMON RAIL DIESEL INJECTORS X 5. Screw Form: Collar Screw. WASHER SEAL Thread Length: 54mm. 4 x Injector Copper Seal ( 6110170060 ). Kit includes : 4 x Injector Bolts ( 0009902907 ). INJECTOR BOLT FOR COMMON RAIL DIESEL INJECTORS. Screw Form : Collar Screw. WASHER SEAL It can also be used for acid water, corrosion and break pads.